Running a fleet effectively requires keeping a close eye on assets while they’re on the road. That’s why the TND™ 760 and the new-generation TPC 7600, combined the Rand McNally Connect web portal, offer features like Mapping, Driver and Vehicle Performance Scorecards, Critical Event and Vehicle Maintenance Reporting, and more. Now, through a partnership with SkyBitz® and TrackPoint Systems, you get even more value, with trailer tracking. Understanding the location of assets and how they are operating is increasingly important in today’s transportation industry. Customers are continually demanding more transparency regarding their loads and the security of these. For more information on how the combination of Rand McNally’s mobile fleet management solutions and trailer tracking can benefit your business, give us a call at 1-800-789-6277. The 2013 Mid-West Truck Show & Convention happening February 1–2 in Peoria, Ill is here. 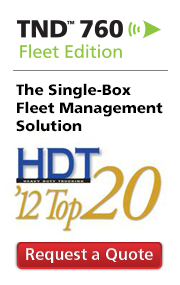 Stop by Booth #634 to learn why fleets are selecting the TND™ 760 mobile fleet management solution. Plus, the TND™ 760 helps you save time spent on HOS administration, simplify compliance and safety, streamline driver-fleet communications, lower costs, and optimize overall fleet performance. In our continuing efforts to offer the best, most comprehensive TND™ 760 and TPC 7600 experience possible, Rand McNally is now partnering with BOLT Software, a leading provider of internet-based fleet management. Provide the “eyes and ears” from the road to the back office. To learn more about the partnership between Rand McNally and BOLT Software, and how your fleet can benefit, call us at 1-800-789-6277.